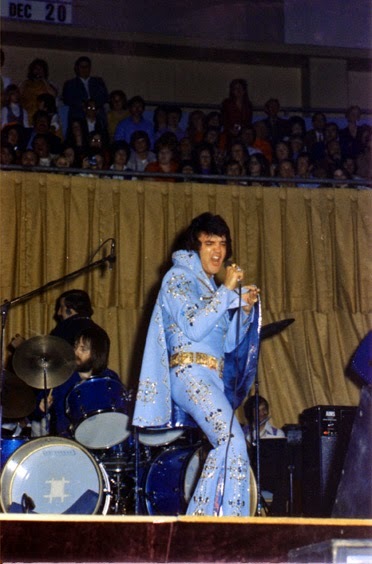 Reeling and rocking in the 'rock room' today is a warm soundboard recording of Elvis Presley live in Las Vegas during a midnight performance on August 11, 1972. Presley was playing fairly consistent and definitely rocking shows during this era and this recording includes a masterful performance as well as quality sonic aspects. 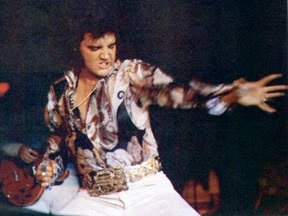 While Presley's sets would stay static throughout a tour, the performances were often different in vibe and attitude. This capture finds Presley and the band in peak form and playing a varied and impressive set. This is a dry line recording with all instruments audible, but some of the top end is flattened a bit. The strength of the performance outweighs any sonic anomalies the recording contains. Except for a few spots this boot contains very acceptable sound quality. The concert and recording begins with the instrumental 'Also Sprach Zarathustra' as a proverbial lead in and warm up for the opening number. The recording is titled, Elvis At Full Blast, fittingly as the band ignites the opening 'See See Rider' on Ronnie Tutt's enthusiastic percussive opening. 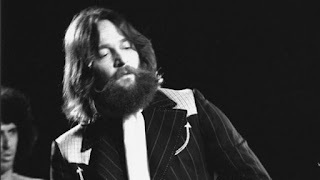 Presley veterans and rock legends Jerry Scheff (Bass) and James Burton (Guitar) are both tight as the bolts of a bridge as Sheff climbs the ladder of his bass and Burton pokes numerous stings with his solo. Taking no moment to pause the band segues into a sneaky 'I Got A Woman', sung slyly and low by Elvis. Hand claps and golden cymbal bells drive the tempo higher and higher with Presley growling as smoke pours from the doors of the band. A quick pause for a 'Thank You' from the King and the band is off into a churning 'Proud Mary'. Burton laces stringy Telecaster lines under Presley's vocals, weaving with Scheff's brisk alternating bass lines. Deep almost humorous backing vocals reply to Elvis's pleas but somehow sound exactly perfect. Three high octane classics come from Elvis without a moment to breathe as his professionally amazing collection of musicians slap everyone right in the face. Good stuff. 'Until It's Time For You To Go' follows, bringing the tempo down for a few. Elvis begins choking (on a drink) slightly causing a false start. After the intense rock and roll introduction, this number is a chance to spotlight Presley's vocals in a intimate setting. Swelling strings and music box piano outline the crystalline framework of the song. Part of Elvis Presley's everlasting appeal is his masterful interpretation of others songs. On this recording is an absolute bombastic and intimidating version of 'You've Lost That Loving Feeling'. A leisurely bass drone moves the groove like a slow march through thick swamps. Presley grabs this one and does not let go, the band floating over evening waters behind him. Steady and invested Presley boils over in a dramatic froth on the chorus, later turning the songs recognizable breakdown into a hand raising gospel review. Hitting a groove that most bands stay up late dreaming of slotting into, Presley stage favorite 'Polk Salad Annie' boogies sprightly while Presley notices the fine ladies in the audience. The central part of this jam leaves the confines of the International arena as Sheff takes a fat fuzzy bass 'solo', followed by some syrupy Burton soloing. The band is hot to the touch at this point, slamming into a rubber wall for a conclusion accented by wonderful Presley vocal interjections. After a humorous interlude where Presley apologizes for the explosive reading of 'Polk Salad Annie', there is some great dialog between Presley and the ladies seated in the closer rows. 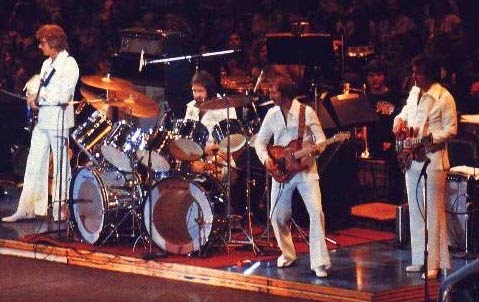 The band then begins 'What Now My Love' a song that would later reach amazing mature heights during Presley's Aloha From Hawaii special. It is given a glorious reading here. 'Fever' follows, flushed and slinky, sung in clandestine fashion by Elvis. Exaggerated and honest, the shading reading of 'Fever' brings down the vibe while still keeping it humid. Scheff and Tutt control the groove with perfect accompaniment. A song tailor made for Presley of there ever was one. With only a brief pause, Presley breaks into a showcase of his early catalog, with a loose version of 'Love Me' that begs on two knees to the great delight of the females in the audience. The rhythm section again thumps along ecstatically to Presley's vocal direction. 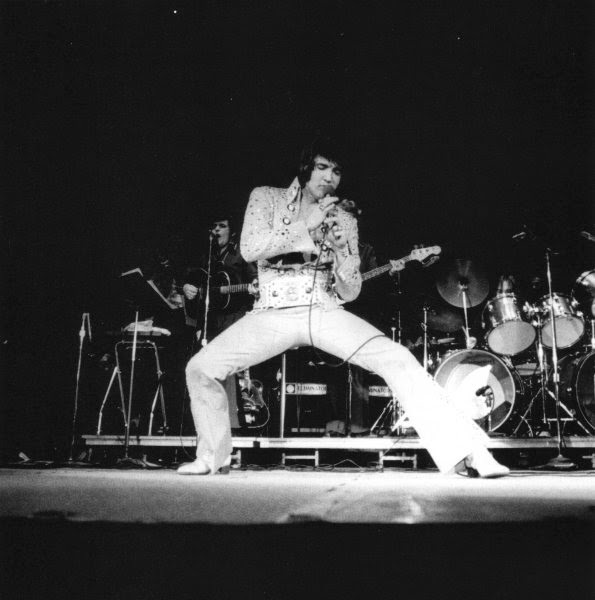 The momentum of the performance again increases with a jittery medley of Elvis's early hits beginning with warp speed 'All Shook Up' that quakes with nervous energy. 'Teddy Bear' follows close on the dissipating exhaust of 'All Shook Up', and then segues seamlessly into a pleading 'Dont Be Cruel' highlighted by Burton's flawless Telecaster strokes. 'Heartbreak Hotel' continues the flip card through Presley's early hits. 'Heartbreak Hotel' benefits from the sparse arrangement and Glenn D. Hardin's sugar sweet black and white sprinkles. Another brief pause and the band leaves a breeze with a rockabilly 'Blue Suede Shoes' that taps its toes erratically on the checkered linoleum. Then jumping forward a few years into the catalog, a train engine 'Little Sister' leaves the station at a full clip, slipping seamlessly into the Beatles 'Get Back' like they are the same song. Tutt has puffs of smoke coming from his kit, moving the musical train smoothly down the steel rails. Presley sings with in a low key attack, patiently and melodically weaving around the groove. Highlight. The power and grace of this accumulated Presley band is illustrated on the slobbery slick version of 'Hound Dog', that unlike the original, prances on a funky wah-wah drenched instrumental track. One unleashed, the group breaks into a double time rendition, sinking there teeth into a tasty musical treat. Following 'Hound Dog', Presley comments to the audience that he did not like 'Love Me Tender' responding to audience requests for the song, before telling the band to begin 'It's Over'. A moving and dramatic version of the song that would also reach extravagant heights on Aloha From Hawaii follows. Swelling strings elicit all of the smooth emotion from Presley's vocals. A much better choice than 'Love Me Tender' would have been in my opinion. 'It's Over' acts as a prelude to the smoking version of 'Suspicious Minds', appropriate to this era that nips at its heels. Played at a greased lightning speed, the song combines all of the elements of Presley's live stage show at this time; the grooviest band, emotive vocals, big horns and imposing strings. After a quick break, Presley then introduce the members of his his band as they vamp on virtuously behind him, prepping for the apex and conclusion of the performance. 'My Way' begins on a solitary piano figure with Presley's comforting refrain, a sweet velvet statement building in intent and purpose, on the support of the strings that enter like a midnight guest. Only Frank could have done it better. In contrast, the version of 'A Big Ol' Hunk of Love' that follows was originally an Elvis classic hailing from 1958 and bearing the distinction of being the only single recorded while Presley was in the military. This rendition is as hot as black asphalt in the desert, featuring a heavy left hand on the piano and Burton shredding to pieces a rock and roll guitar solo. Presley groans with the early sexual tension of his original singles as the band thumps in hard syncopation. A huge and fitting performance and possibly the finest of this fantastic evening. Following the rock clinic that just occurred, Presley answers a screaming fan with a low throated 'What Kid? ', before unfurling 'An American Trilogy'. Comprised of three historical songs, 'Dixie', 'All My Trials', and 'The Battle Hymn of the Republic', Presley started to perform the song in 1972. The climactic performances would grow in stature and intensity, eventually becoming an essential element in Presley's sets, exploding like fireworks and in many instances stopping the show in breathtaking fashion. This evening is no different, with Presley completely invested in the reading of the song, like a bookworm in a new library. The evenings performance closes on the expected and towering, "I Can't Help Falling In Love With You', designed to send the ladies of the crowd home pining for more and to close the evening on a theatrical and sensational note. The available recording of Elvis Presley captured live during the Summer 1972 Las Vegas residency, finds the perfect combination of Presley the rocker and the crooner, while playing deep cuts, towering emotional ballads and classics from his deep catalog. Unfortunately following 1973, Presley's live performances would start take a slow down hill turn, remaining inconsistent for the remaining four years of his life. Recordings like the Elvis At Full Blast bootleg are valuable to rock fans for their deeper investigation of the nuances and eras making up Presley's diverse career. This particular recording offers the listener a smorgasbord of the elements that make Presley the King of rock and roll and why his legacy continues to grow in stature.